View the Watchmen movie trailer on myvu.com and get the hidden code to save over 10% on Myvu Crystal! IDW Publishing has provided The Continuum its solicitations for May. Archie Comics has provided The Continuum its solicitations for May. For covers and five- to seven-page previews of Dynamite Entertainment titles arriving in stores on Feb. 18, CLICK HERE. Titles include Battlestar Galactica: The Cylon War #2, The Death Defying 'Devil #3, Highlander Origins: Kurgan #2 and Garth Ennis' Battlefields: Night Witches TPB. For previews of BOOM! Studios titles arriving in stores on Feb. 15, CLICK HERE. 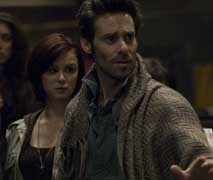 Sci Fi Channel has released four images from "Deadlock," the Friday, Feb. 20 episode of Battlestar Galactica. "Ellen is forced with a decision that could have repercussions for humans and the future of the entire Cylon race." 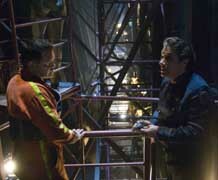 Shown in the images are Tricia Helfer as Number Six, James Callis as Dr. Gaius Balta, Aaron Douglas as Tyrol and Edward James Olmos as Admiral William Adama. 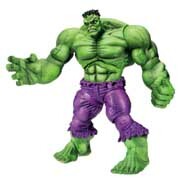 Hasbro has announced that its line of Marvel Universe 3.75-Inch Action Figures will include a total of 34 single-pack figures throughout 2009. Each will feature unique accessories and a "top secret" file card. Suggested retail price for the figures will be $7.99. * Wednesday, February 11: Archie Comics First Looks, The Human Target and Knight Rider.